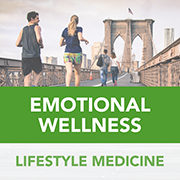 Currently, lifestyle medicine focused practices usually align with primary care practices in conducting basic depression screening, treat mild cases, and refer severe cases. A lifestyle medicine practice which aims to facilitate health behavior change, needs to screen for a spectrum of stress and mood disorders, as well as offer positive psychology interventions. Although USPSTF only has a recommendation for depression screening and counseling, a lifestyle medicine practice which aims to facilitate health behavior change, needs to screen for a spectrum of stress and mood disorders, as well as offer positive psychology interventions. Mental health and emotional well-being are essential to support/promote efforts for health behavior change. Moreover, emotional well-being habits, such as social connectedness and living with purpose/meaning independently impact health outcomes and longevity.